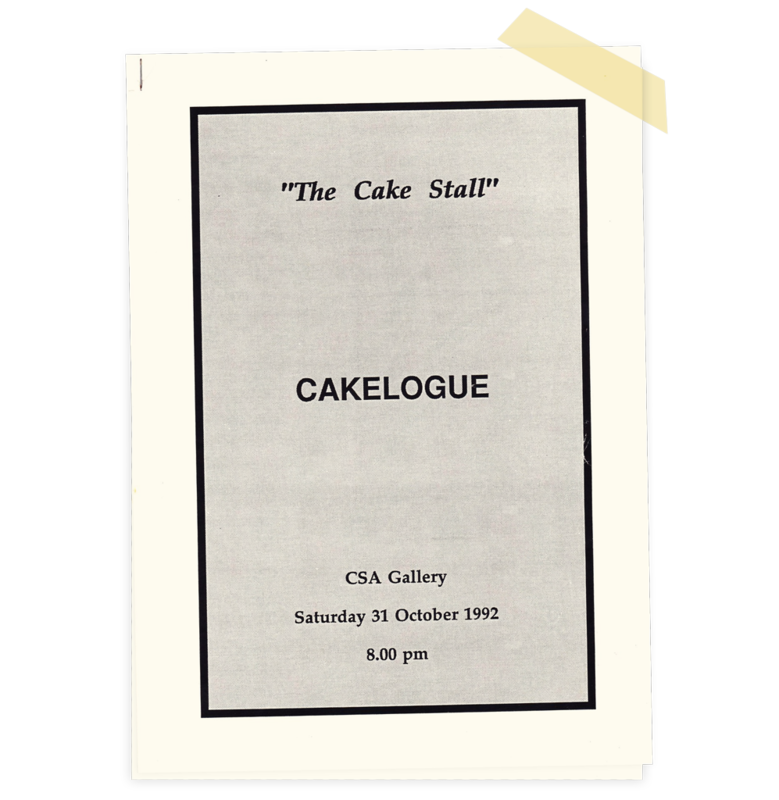 Now that all the social brouhaha has died down, the time has come for a retrospective critical assessment of ‘The Cake Stall – A New Zealand Celebrity Cake Exhibition and Auction’ held in the CSA Gallery in Christchurch on 31 October 1992. Cake was finally acknowledged as the art form it is, and, moreover, below the glittering social surface of the occasion, one could clearly discern a radical social subtext. The cake-makers included not only professional chiefs but high achievers in fields where cake operates minimally. Jim Bolger, Mike Moore, and Jim Anderton, along with such luminaries as Bill Ralston, Sir Michael Fay, Gil Simpson, Malcolm McNeill, Canon Bob Lowe, Sir Richard Hadlee and other equally distinguished men were set free at last from the deadly, day-to-day drudgery of political, commercial and conventionally artistic life, and given a chance to allow sensitive cake-making selves to expand. Through the work of these artists the Christchurch cognoscenti were invited to renew their relationship with cake – to consider it as an object of experience – to reassesses the whole cake dynamic. The perception of cake as art, though not totally new, still takes some swallowing. Yet cake, as social icon, has a long history. As early as the 1940s mothers, taking their children to afternoon teas, instructed them (shaking them slightly to add emphasis to the instruction) that, should they be lucky enough to be offered anything to eat, they were, in the first instance, to ignore all cakes in favour of the plain sandwich, and that in no circumstances, except possibly to save human life, were they ever to take the fanciest cake on the plate. It was understood by women, with their more highly developed intuition, that the fanciest cake – the one on which eye and appetite were most intensely focused, the one on which art had most conspicuously been lavished – was an object of contemplation rather than consumption. Above: An exerpt from Margaret Mahy’s “The Witch in the Cherry Tree”(1974 J.M Dent & Sons Ltd) which delighted readers worldwide, and also established Mahy’s credentials as a social commentator of cake. Yet there is a paradox. Cakes are made to be eaten. The true cake must submit to the munching world. Vita longa, placentae brevis, (life is long but cakes go quickly) is a phrase frequently invoked by cake-lovers, particularly with reference to chocolate cake, which is so frequently here today and gone tomorrow (or at any rate the day after). However, not every work of art needs to be a monument. The liberated art-lover is happy to celebrate the way in which our responses to cake define our humanity. Dame Ann Hercus and a dedicated team established the parameters of the happening. None of the proto-artists was allowed to seek assistance in the composition of the cake itself, though expert assistance was permitted when it came to the final decoration and presentation. Having been subject to critical scrutiny by an educated audience of cake connoisseurs, their judgement finely honed and made more acerbic by wine, the forty beautiful cakes were auctioned by Jim Hopkins, a man known for his deep sensitivity to cake identity, and the proceeds of the auction were donated to the Women’s Refuge. Above: The current craze for cupcakes and intricate cake making is part of a long baking tradition with roots back to the early European settlers of New Zealand. 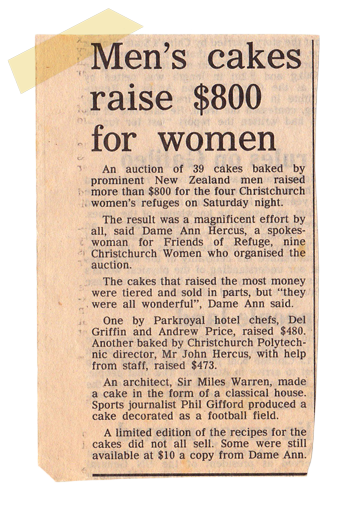 In the early 1990s a Christchurch group, fundraising for Womens Refuge, subverted the tendency for women to be the traditional cake bakers, by inviting men to bake cakes for a cake stall. The idea for The Cake Stall fundraiser arose very much out of the context of the early 1990s, which included some witty and memorable political protest campaigns such as this poster from the Womens International League for Peace and Freedom. Perhaps it is still too soon, since the perception of cake as an art form is emergent rather than established, to single out particular cakes for praise or blame. For all their variety, the majority of cakes leaned (metaphorically) towards traditional and conservative forms. Jim Anderton’s banana cake, iced with chocolate icing and sprinkled with coconut, though it might not make one rush out and vote for him, was certainly one of the most touching cakes on display – a cake as sincere as it was unassuming. One could not doubt that he had made it himself. Yet there was probably more stark realisim in the dark overtone of Richard Ballantyne’s cakes, both of which were subsumed under the accurate title Burnt Offering. Many entries were self-referential. Jim Bolger presented a simulacrum of the Beehive, involving eight eggs and butter cream icing. A cake like this has the capacity, given any temporal extension, to acquire overtones either of joyous confirmation or of irony and regret. Del W. Griffin, executive sous-chef of the Parkroyal Hotel, eschewed symbolism in favour of design and produced Parkroyal Chocolate Elegance, a bravura composition in the rococo style – three elegant tiers incorporating hazelnut praline and ribbons of both white and dark chocolate. And John Hercus, supported by a team of six assistants, won universal applause for his entry which coupled political correctness with brilliant technique – an exquisite chocolate waka sailed over a model of the South Island, the provinces of which could be detached and sold or eaten separately. This established a fine tension between the title of the whole composition – Mainland – and its inherent potential to disintegrate into separate identities. Above: ‘Whilst it wouldn’t necessarily make you rush out and vote for him’, Jim Anderton’s Banana Cake, ‘as sincere as it was unassuming’. By contrast Jim Bolger’s Beehive, overtones of joy?, irony?, regret? Chocolate provided a unifying theme for cakes by Malcolm McNeill, Mike Moore and Bill Ralston, though each cake exhibited its own sturdy individuality. Mike Moore’s cake apparently had the capacity to serve as pudding in moments of crisis, while Bill Ralston’s sported a rugged surface intended to suggest the complexion of its maker. Other cakes incorporated the essence of a New Zealand experience. Nigel Hampton’s Buzzy Bee used cake to confront us with an icon of our infancy, and one did not have to read the title of Phil Gifford’s cake to recognise a Footie Field. The recipe of the latter (recipes for all these cakes are available) concludes, “Bung some goal posts at each end,” an instruction unique in cake-making history. At least I have no recollection of it ever appearing in the Edmonds Cookery Book. Yet, for all their novelty the cake forms already mentioned were, at heart, traditional. Other exhibits were more avant-garde and even subversive. The cake submitted by Christchurch architect Jonty Rout was an essay not so much in deconstruction as in preconstruction – his was not the conservatively categorical cake but something more contingent. Within the appearance of a cake (named S*N*A*K*) were contained the ingredients necessary to make that cake. Thus, in order to fully possess this cake, the aficionado was forced to move from passive to active mode. Alistair Williams, late of Tiffany’s Restaurant, now of Aikmans in Merivale, produced two cakes, both of which had been subject to random happenings, one the uncontrolled intercession of a dog, and the other a contest between momentum and a suddenly static state due to a sharp stop in crowded traffic. These cakes acknowledged, in their creative disarray, the arbitrary entropic nature of the universe in which we attempt to establish such highly ordered systems as sponge cake or even pavlova. Anarchy lurks under the coconut, and may even be discerned, moodily reflected, in the most sleekly iced surfaces. Cakes often suggest our uneasiness over the incalculable essence of a universe we cannot command. Perhaps this philosophy received its apotheosis in Richard Till’s cake LIFE (in organza purple and teflon) alternatively titled The cake of infinite mass. In the microcosm of this cake, ambiguously entering into the state of ‘cakeness’, one could perceive the macrocosm of the universe. Among the ingredients mentioned in this recipe are paper flowers, ‘peculiar cheeses’, love, time and ‘unusual foreign bodies’. In this creation the cake took on a post-modern aspect which might well leave lovers of the traditional cake puzzled and ambivalent. Above: Whittakers artisan chocolate range: a sample of Branded Content Sponsorship in transmedia content. As an investor I could not afford the more ambitious artwork, which went to perceptive syndicates, but I was moved to bid for a cake submitted by one of the many Dave Wilsons who work for the Christchurch Press. It was a light fruitcake, cut and iced to resemble a book open at an inscription about eating one’s own words. Though currently on a diet, I did not hesitate to eat them. For this is the central mystery of cake art. 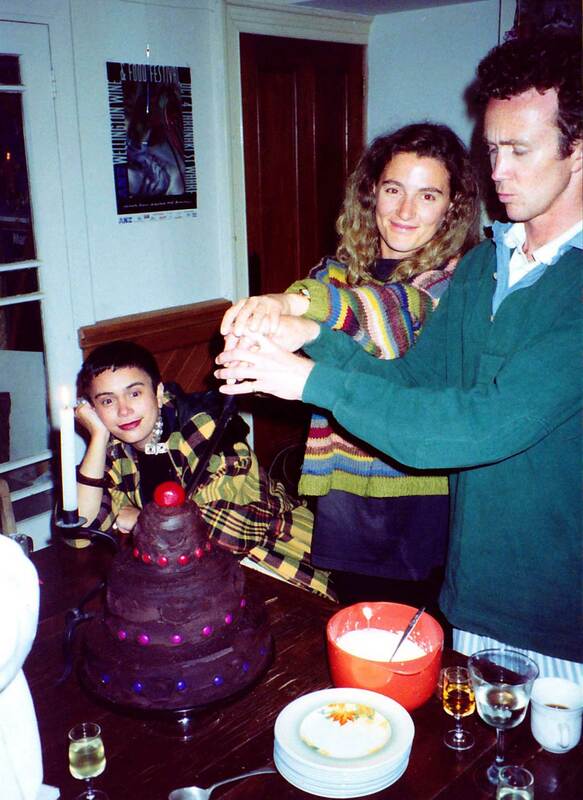 The cake-eater fulfils the cake-maker, which is why I feel my own edge of ambivalence about Richard Till’s cake, along with Neil Dawson’s entry 4-tier Kiwi house iced epoxy cake, whose ingredients include medium-density closed cell PVC, pigment paste and epoxy resin. ‘Contact with resin can cause blocking of the pores and drowning in body fluids,’ we are warned in the recipe. My instinct suggests that this may be extending cake boundaries too far, reducing the cake to an intellectual toy of the cerebral cortex, rather than a creation which is fulfilling to the crocodile brain as well. Cake art does not lie in holding the cake-as-object at a single point in time, but in an uncompromising progressive relationship in which the observer metamorphoses into consumer, and the cake from outside object to a contained form. Cake is subjected to a series of critical processes, unconscious, yet more stringent and terminal, more organic and subliminal, than any other work of art. The art objet becomes part of the art-lover’s flesh and blood. Its brooding, internalised presence can be apprehended when the art lover steps onto the scales on the day following the consummation. On the days immediately following “The Cake Stall” exhibition, the occasion branched out all over the murmuring city in a series of cake-tasting parties, which kept the flow of cake assessment moving through the community, and because of this I can personally attest to the artistic integrity of John Coley’s No Fail Pomo Chocolate Cake. Cake consumers and cake makers had been united in feeling themselves to be at the advance guard of an art, old in domestic history but needing a new dialectic to express its power and ambience. All praise to Countdown and the Christchurch Polytech who sponsored this remarkable event. Recipe books (in which one may encounter Tom Scott’s Granny Smith Surprise, a word cake which requires the cook to consume at least four gin and tonics) are available, and worth buying, for here one is made aware that cakes have the capacity to become part of literature – but that is another story – and one which slices beautifully. Originally published in The Listener January 1993, republished in Dissolving Ghosts, Essays and More, Margaret Mahy VUP 2000, and here as a transmedia article with kind permission of Mayhem Multimedia . 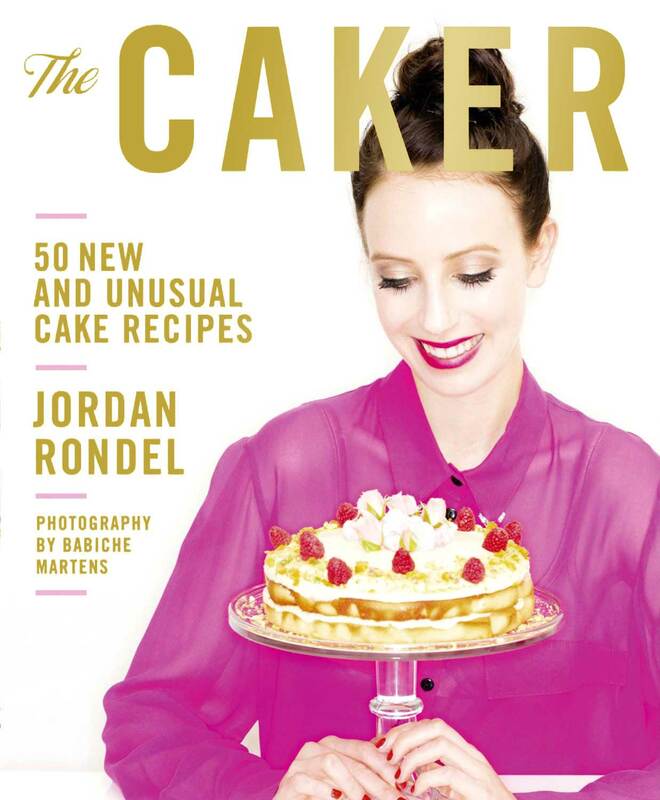 The Caker, by Jordan Rondel (Random House 2013): a sample of Branded Content Sponsorship in transmedia content.